Hooray!!! Today is our first official day of summer. Yesterday was the last day of school and to say that we are excited would be a mild understatement. It has been a wonderful school year and my kids have learned and grown so this year...BUT we are ready for some swimming, relaxing, exploring and lots of fun in the sun. Our summer is so short - only 2 months and then we are back to school - and I know it will fly by. Besides going to the pool a lot and doing our first summer of swim team, I want to make sure we make time for the things we don't normally have time to do during the school year. I decided that it would be fun to come up with a Summer Bucket List for us and fill it with all sorts of amazing activities. The kids helped me brainstorm our list and I'm hoping we can have at least one outing or special activity each week. I guess my ultimate goal would be to complete the entire list before they head back to school, but we'll see! Since this is our first time doing this, we'll see if we make it through our list. However, even if we don't accomplish it all, I know we'll still be in for lots of fun this summer! What do you have planned for this summer? 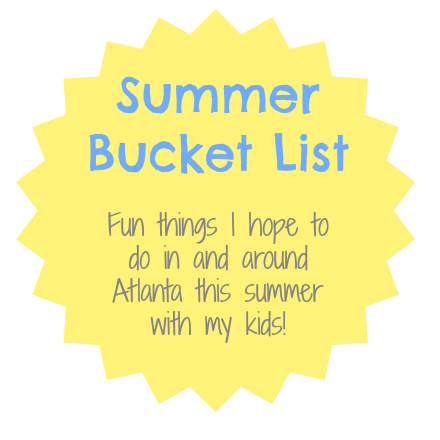 Is there anything special on your own summer bucket list to do with your kids? Please share your ideas! I might even add to our list. I hope everyone has an amazing holiday weekend and a wonderful start to your summer! Sounds like a great list! I need to get mine finished. I'm envious of the food truck events - we don't have those here and I've heard they are awesome. Actually it sounds like Atlanta has a lot of fun things to offer!! Happy Summer!